Theater District Parking is a vital, hidden asset that serves Houston&apos;s central business district round the clock and the downtown performing arts facilities during show times. The garage spans 18 underground blocks and consists of 3,369 parking spaces. At street level, the garage is situated below Jones Plaza, Bayou Place and Tranquillity Park. Parking couldn’t be more convenient for a night on the town. Cost of parking is $12; hourly parking is not available until further notice. The underground parking were hit hard by Hurricane Harvey when flood waters filled all three levels with more than 270 million gallons of water. Although the garages are operational, additional work remains before they are fully restored. Trams will be available to shuttle those customers who need assistance. Customers should notify a garage attendant upon arrival, if they need this service. The Theater District underground parking garage includes three garages (green, yellow and blue), which span 18 underground blocks and consists of 3,369 parking spaces. SP+ - which operates many lots and garages from NRG Park to downtown Houston. Metered street parking information can be found HERE. Metered street parking is free after 6pm and all-day on Sundays. Remember these parking tips to avoid a parking ticket! MetroRail is a great option to avoid finding parking in our area. Visit their website for schedules and rates. 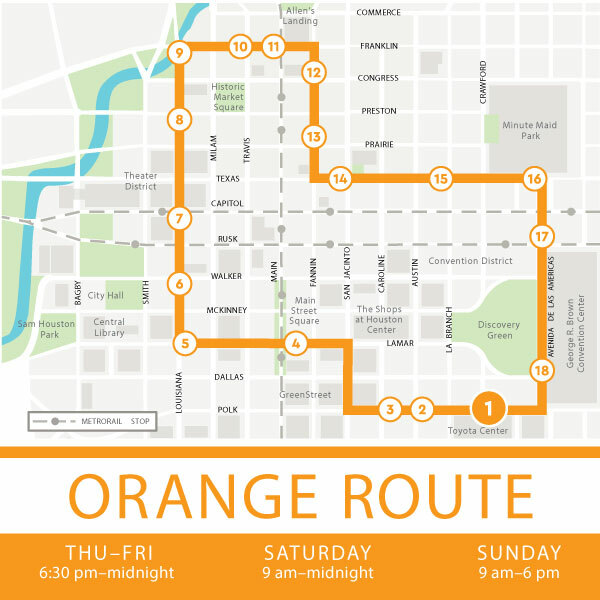 GreenLink (Orange Route) is free bus ride around the downtown area operating Thursdays-Sundays during specific hours. See the schedule for complete details. Taxis are a flat $6 within the Downtown area. A great option if you must find parking further away from the theater. Use ride-sharing apps like Uber and Lyft get to and from the theater. These may also help if you had to park a good distance away from the venue. At Jones Hall the ride-sharing drop-off/pick-up location is on Louisiana St. Just look for the signs for the drop-off/pick-up area! Use The Wave, a jitney service which operates Thursdays – Sundays. A jitney is a hybrid between a taxi, Uber and public bus.Read more about their services and see if they are right for your next trip to the Theater District. All three levels of the underground parking garages filled with flood waters from Hurricane Harvey and efforts to restore the garage continue. If you are unable to reach this number or the garage is closed, please call Andy Frain Security at 832-982-7357. Article II – Payment – The Lessee agrees to make payment to the Houston First Corporation, either at the Parking Garage (Premises) on or before the 5th day of every month, by the 26th of each month. Payments are for the entire calendar month. RENTS ARE DUE AND PAYABLE REGARDLESS OF WHETHER LESSEE USES THE PARKING SPACE UNLESS PARKING AGREEMENT IS CANCELLED PURSUANT TO ARTICLE III OF THIS AGREEMENT. Denote your Contract Card Number at time of all payments. The Lessee agrees to continue the payments of this amount until termination/cancellation (notice of cancellation required 10 days prior to the end of the month) of this agreement or until duly notified of a change of the stated rental fee. Failure to continue payment places the Lessee in a delinquent status and gives the Lessor the right to prohibit the access of the lessee onto the premises for the use of the parking space. All sales final. Your payment is being processed using JPMorgan Chase Paymentech. As part of this service, Houston First collects information necessary to complete the transaction. Any information that is provided to us may be stored for future correspondence. Downtown construction may affect your arrival time. Please plan accordingly.